We design our systems from the ground up to specifically meet the needs of each of our association clients. We realize that each association likes to do things their way; the way their members are accustomed. We design our system for maximum flexibility, using the latest Microsoft .NET technology. Show management has real-time access to intuitive reports on every aspect of the registration process. Financial tracking is live and includes tracking via batch numbers, authorization numbers, payment type, and payments broken down by date. 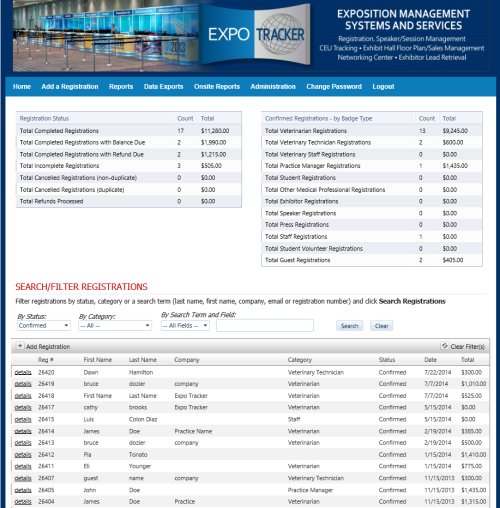 Show management has access to the Expo Tracker Management Portal. This powerful tool gives show management and their staff the ability to manage the registration process in-house rather that outsourcing the registration management to Expo Tracker. We configure management logins to provide limited access to some staff members, and full access to others. The management portal provides complete financial tracking, reporting, over-ride capability, quick data entry, membership management, exhibitor allotment management, discount code management, cancel/refund ability and much more. Multiple fee types: Our system will guide attendees through the registration process offering only the rates that each individual attendee qualifies for based on membership level or other determining factors. As members, non-members, and other registration classifications register, our system will display only the appropriate rate category. System Integration: ET has the ability to integrate our registration system with many different association management systems. Show management can process registrations using their in-house systems and ET can link directly to the database and populate our badge printing system in real-time. This allows show management to continue to use their in-house system on-site and utilize the ET badge system to produce badges and tickets that include a 2-dimensional bar code, a plastic card with an embedded magnetic stripe, RFID transponders embedded in thermal paper badges, or Plastic Cards with embedded NFC chips for lead retrieval and session tracking. Demographic Information: ET customizes our system to collect and report on a wide variety of demographic information, with both required and voluntary questions. Discount Codes: Show management can include special discount codes that attendees/exhibitors input directly during the registration process and receive a corresponding discount. Show management can add/delete discount codes directly through the management portal. Membership Verification: ET can connect directly to show management’s Internet based membership database and verify membership in real-time. Attendees can update their records, join, or pay renewal fees and complete the registration process as a member. ET can also import a static copy of the membership database and verify the membership for each registrant attempting to register as a member. Update and review records: All registrants, exhibitors and attendees, regardless if they have registered via the Internet, fax or mail, have the ability to review and alter their registration information via the Internet. Attendees/exhibitors use a secure password created during registration to access and make changes/additions to their registration information. Group Registrations: The ET registration system is designed to allow attendees and exhibitors to register as a group and pay for multiple registrations with one consolidated transaction. This process greatly reduces the amount of data entry for attendees and exhibitors. Exhibitor Badge Allotment: ET can import your list of current exhibitors into our system, or live integration when utilizing the ET Exhibit Sales Module. This enables ET to limit the number of badges offered to exhibitors based on show management’s allotment policy, and calculate the payment required for all exhibitors over the badge allotment. Show Management can easily add new exhibitors or adjust allotments from the management portal. Name Badges & Event Tickets: We program our system to produce name badges and event tickets or session cards simultaneously. Tickets can be printed with attendee name, corresponding registration/membership number, event name, time, date/location, or any other information requested by show management. Session Tracking: We track the number of participants attending any limited seating session or ticketed social event in real-time. We indicate the number of available seats for each session and immediately take the space out of inventory when a transaction is completed. Wait List: We configure our system to track a wait list of attendees attempting to secure space in closed events. The system sends an email as space clears in the requested event. Time limits are set to prompt the next email in the queue. Wait lists also capture attendees interest after sessions sell out.